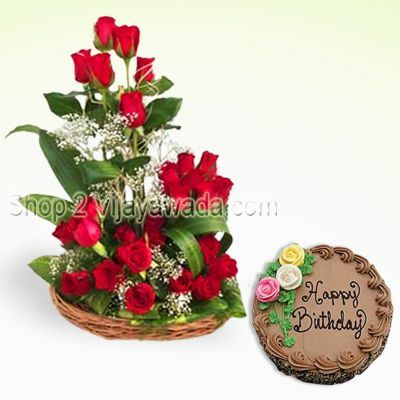 Our Masterpiece Combo consists of 30 red roses and a rich delicious Chocolate cake. Our professional florist has arranged 30 blooming Red Roses some of them long stem very beautifully in a basket and greenery and fillers have been added to make the arrangement even more attractive. The rich chocolate cake is the added attraction in the Masterpiece Combo. Send roses bouquet online to make the special day of your loved one memorable.The Masterpiece Combo suits every occasion; birthdays, anniversary and other happy events.